Welcome! We are so excited you want to take advantage of our free class offer. Our studio prides itself on being a welcoming atmosphere that caters to all forms of mind/body/soul movement. 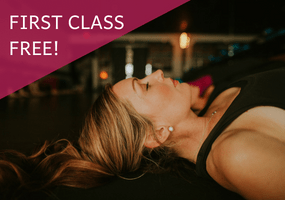 Barre, Balance, Cardio, Fusion Fitness, Private Training, and Yoga…we’ve got it ALL and we know you’re going to LOVE IT HERE! Click here to read about our classes. This free guest class pass is good for new clients and for adult fitness classes only. Please create an account by filling in the form at the bottom of this page so that you may redeem your complimentary experience. Please note our class cancellation policies when you receive your class confirmation email. More scheduling tips are listed here. Youth Services is available on Monday, Wednesday and Friday mornings during our peak class times so you can bring your little ones with you. Reservations are required, as space is limited. Youth Services cost $5 per child per visit, or you may purchase a package of 10 visits for $30. If childcare is not offered during your class time, our friends at Child’s Play is located just a few doors down from our studio. Here is our FAQ page for any questions you might have. If your question isn’t listed, please don’t hesitate to email us at frontdesk@releveone.com or call us at 615-472-8330 and we will be happy to help. We’re looking forward to welcoming you into our inspiring community!